, one of the finest poets of the Augustan age, was the son of a Roman knight, and a native of Sulmo, a town in the county of the Peligni, now | Abruzzo. He was born in the year of Rome 7 Jo; that memorable year when the consuls, Hirtius and Pansa, were slain in the battle of Mutina against Antony. From his youth, his inclinations lay towards poetry; which, however, upon his father’s entreaties, he forsook, and, with a view to the practice of the law, studied eloquence under those eminent masters, Aurelius Fuscus and Porcius Latro, whose characters Seneca has drawn, and also mentions Ovid’s improvements under them. Such was his diligence and success, that he determined several private causes very judiciously, and frequently pleaded with great force of eloquence in the court of the centumviri. He was likewise made one of the triumviri, who were magistrates of great authority, and tried capital causes. 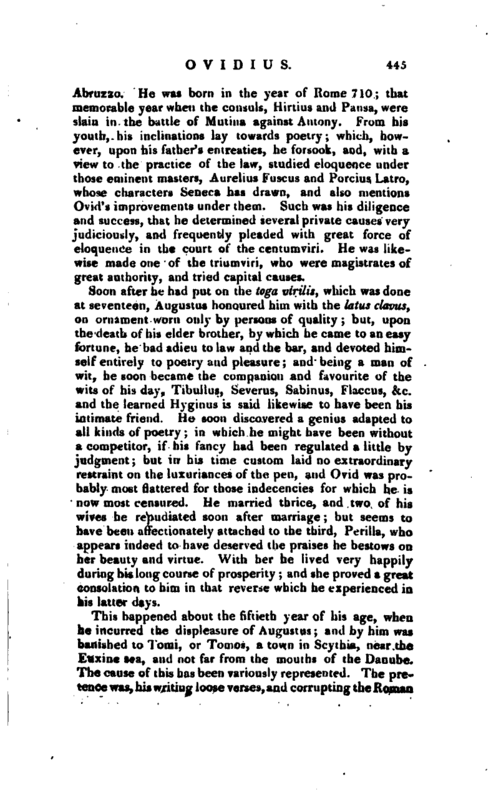 Soon after he had put on the toga virilis, which was done at seventeen, Augustus honoured him with the latus davits, an ornament worn only by persons of quality; but, upon the death of his elder brother, by which he came to an easy fortune, he bad adieu to law and the bar, and devoted himself entirely to poetry and pleasure; and being a man of wit, he soon became the companion and favourite of the wits of his day, Tibullus, Severus, Sabinus, Flaccus, &c. and the learned Hyginus is said likewise to have been his intimate friend. 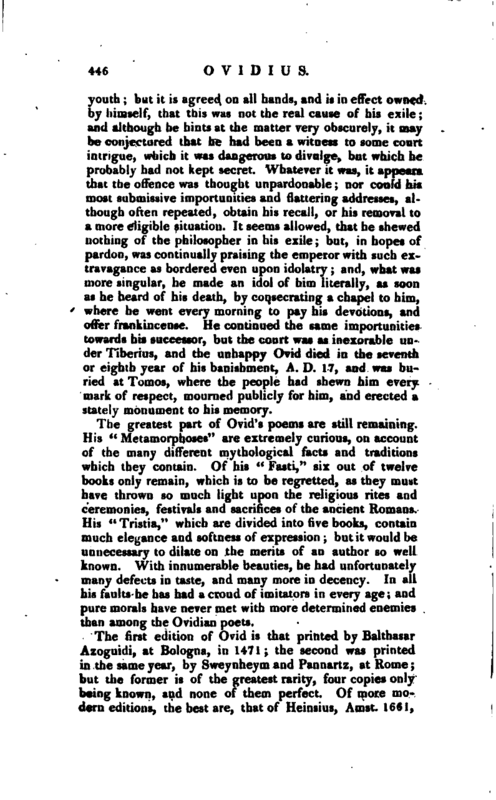 He soon discovered a genius adapted to all kinds of poetry; in which he might have been without a competitor, if his fancy had been regulated a little by judgment; but in his time custom laid no extraordinary restraint on the luxuriances of the pen, and Ovid was probably most flattered for those indecencies for which he is now most censured. He married thrice, and two of his wives he repudiated soon after marriage; but seems to have b^en affectionately attached to the third, Perilla, who appears indeed to have deserved the praises he bestows on her beauty and virtue. With her he lived very happily during his long course of prosperity; and she proved a great consolation to him in that reverse which he experienced in his latter days. 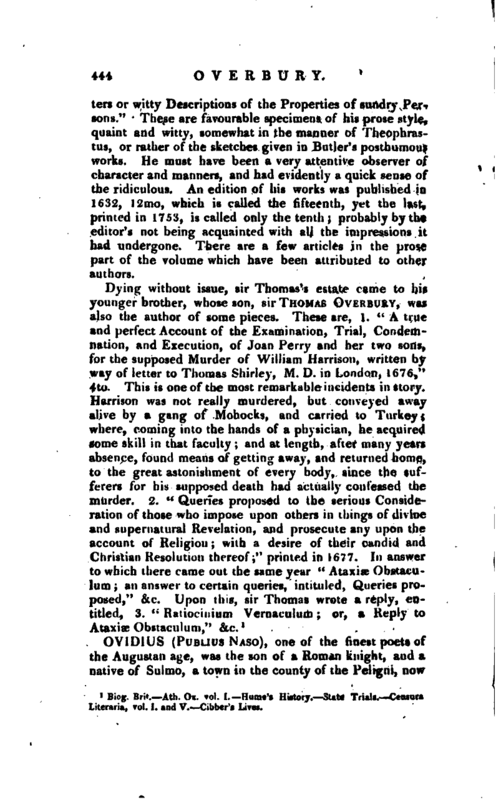 This happened about the fiftieth year of his age, when he incurred the displeasure of Augustus; and by him was banished to Tomi, or Tomos, a town in Scythia, near the Euxine sea, and not far from the mouths of the Danube. The cause of this has been variously represented. 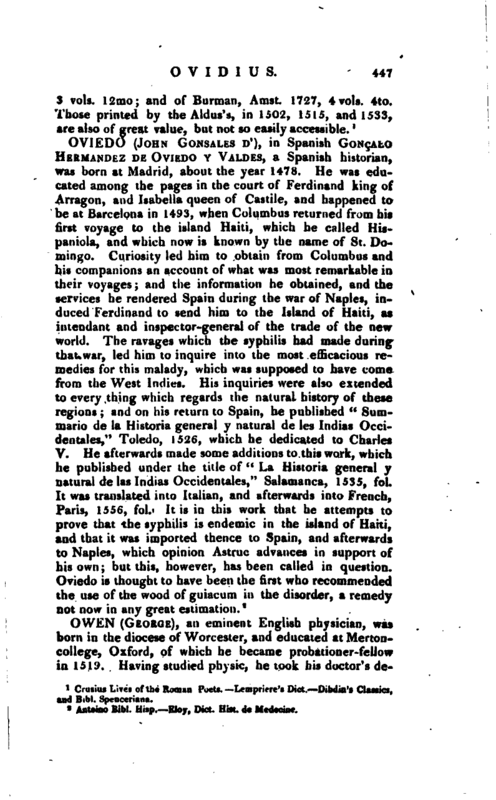 The pretence was, his writing loose verses, and corrupting the Roman | youth but it is agreed on all hands, and is in effect owned by himself, that this was not the real cause of his exile and although he hints at the matter very obscurely, it may be conjectured that he had been a witness to some court intrigue, which it was dangerous to divulge, but which he probably had not kept secret. Whatever it was, it appears that the offence was thought unpardonable; nor could his most submissive importunities and flattering addresses, although often repeated, obtain his recall, or his removal to a more eligible situation. It seems allowed, that he shewed nothing of the philosopher in his exile; but, in hopes of pardon, was continually praising the emperor with such extravagance as bordered even upon idolatry; and, what was more singular, he made an idol of him literally, as soon as he heard of his death, by consecrating a chapel to him, where he went every morning to pay his devotions, and offer frankincense. He continued the same importunities towards his successor, but the court was as inexorable under Tiberius, and the unhappy Ovid died in the seventh or eighth year of his banishment, A. D. 17, and was buried at Tomos, where the people had shewn him every mark of respect, mourned publicly for him, and erected a stately monument to his memory. Crusius Lives of the Roman Poets. Lempriere’s Dict. Dibdin’s Classics, and Bibl. Spenceriana.